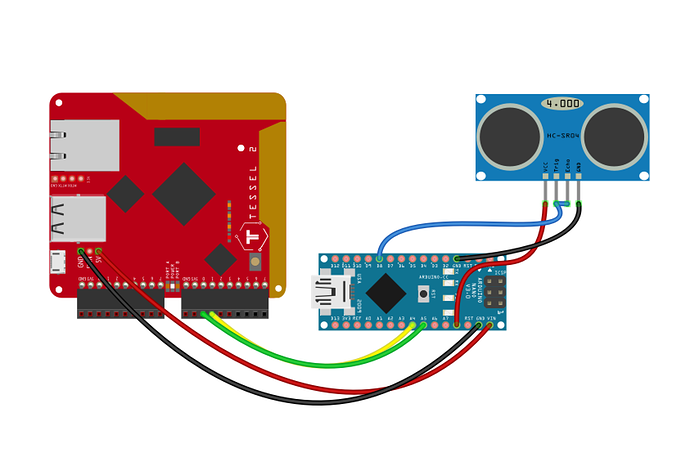 I am trying to use tessel 2.0 with hcsr04 ultrasonic proximity sensor. However, there is no readPulse method for tessel 2.0 api and library. I searched some solutions for readPulse on the net but I did not find examples about proximity sensor. There are some examples with tessel 1 but not compatible with tessel 2. How can I solve this issue? Is there any way to handle that problem? There is currently no plan to support a special case operation for process-blocking pulse reads in the firmware running on the SAMD21. // can make another reliable reading. // In J5 we used a 90ms delay between reads. I've assembled, tested and confirmed the circuit and program above and everything works as expected. Firstly, thanks for your answer. I installed interchange but when I try to configure with interactive mode, I had flashing error. The error is below. I solved the problem without flashing by interchage. I directly uploaded the backpack .ino files(hcsr04_backpack) to arduino nano and it worked fine. Thanks for your answer. I will also deploy the solution here. i have a similiar problem. i've created a setup exactly like yours, tried your code, but it didn't work. but the data will be received on Port B (in your diagram) is that correct? is this backpack compatible with johnny-five? Then: It is not working for me and I have no clue why. I took the exact code from above and it runs perfect (after I took a new cable...). I figured out that the callback in /johnny-five/lib/proximity.js:232 doesn't get called and I don't know why. Sometimes, I get that error. But I don't know exactly when. Socket: The other end sent FIN packet. Error: Socket: The Port socket has closed. Which Tessel 2 port is the HCSR04I2CBACKPACK wired to, A or B? It is connected to port B and I also tried it on the other port. is it possible that a non original arduino nano could be the problem? I had to install special MacOS Drivers to get it connected. It's possible that the cheapo nano is problematic, I just tried 3 different nanos and only one of them actually worked :\ Another thing to check: what voltage source are you using for the HCSR04?